THOMAS STEWARDSON, one of the early pioneers of Shelby County and a man who has made his record for industry, hard work, perseverance and integrity, has a pleasant home on section 24, Shelbyville Township, where his residence dates from the fall of 1849. He was born in the North of England, March 18, 1818, and is the son of William and Mary (Nicholson) Stewardson. The mother died when the subject of this sketch was but a small boy, leaving seven children, of whom Thomas was the eldest. Those who followed him were: Robert, who died in Shelby County; Samuel, went to the West Indies and there died; Isabella, married Mr. Brewster and died in Shelbyville; William; John, who resides in Texas, and Mary, who died in Indiana in 1844. The father of our subject came to the United States, and settling in Illinois, lived in Shelby County until his death. He took up the land for this son two years previous to our subject's coming here. Thomas Stewardson was reared a farmer, and when a young man of some twenty-three years came to the United States, settling in Ohio in the year 1840, and there married three years later the lady whom he had chosen from all the world to be his companion through life. She was Elizabeth Parnell. a native of England and a daughter of John and Agnes Parnell. After marriage they resided in Ohio for some nine years with the exception of one season, which they spent in Northern Indiana. Elizabeth Stewardson became the mother of six children, but was called from them by death in 1856, leaving them to mourn a mother's loss. They are all now grown to manhood and are occupying positions of responsibility and honoring their parents by lives of usefulness and worth. They are as follows: John, who resides in Sac County, Iowa; Thomas, who lives in the State of Washington; James, Robert and William P., who live in Shelby County; and Samuel, who makes his home in South Dakota. In December, 1856, our subject was married to Sarah Brady, a daughter of Thomas and Martha (Vaughn) Brady, and a native of Shelby County, where she was born October 20, 1839. Her parents were of Southern birth and came to Illinois in the pioneer days, taking up and improving land here. Their death occurred in Shelby County, and they left six children, as follows: William, deceased; Jane, the wife of Perry Reed, who resides in Butler County, Kan.; Samuel, deceased; Sarah, Mrs. Stewardson; Narcissa A., who married Hiram Brown and died in Shelby County; and James, who is also deceased. 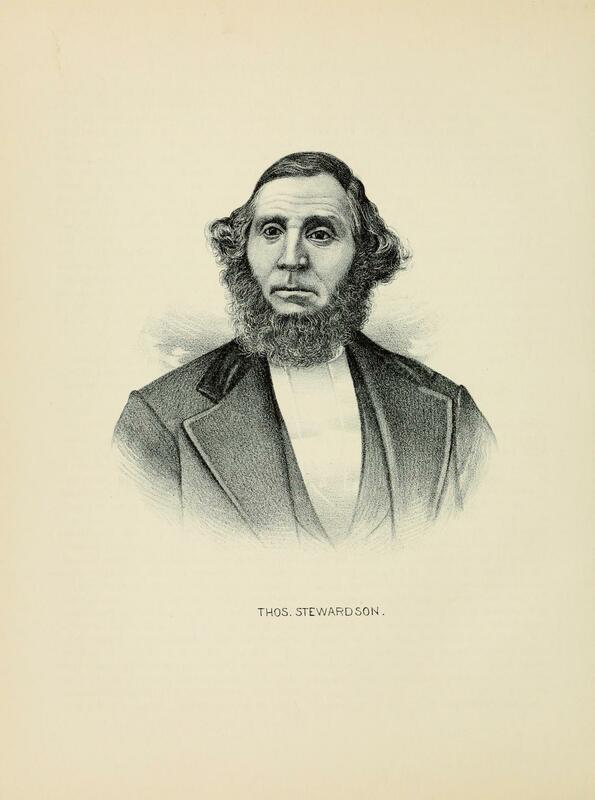 The first possession of Mr. Stewardson in Illinois was forty acres, and he now owns two hundred and sixty, all excellent and well improved land, bearing upon it good fences, excellent barns and a substantial home. He followed sheep-raising for a number of years very successfully and has the qualities which lead to success in that department of work, as he is prudent and attentive to the needs of his stock. He now pursues general farming. Mrs. Stewardson is a member of the Hard Shell Baptist Church and has brought up her seven children in the faith of the Christian religion. They are named: Martha Jane, wife of John Richardson; Edward; Douglas; Henry; Mary, now Mrs. Benjamin Field; Eliza, the wife of Mathew Bainbrig; and Albert. The political views of our subject have brought him into sympathy with the Democratic party, for whose success he is desirous, but he is not at all an office-seeker, although he has filled successfully the position of School Director. Elsewhere in this volume the reader will find a lithographic portrait of Mr. Stewardson. Extracted 29 May 2017 by Norma Hass from 1891 Portrait and Biographical Record of Shelby and Moultrie Counties Illinois, pages 286-288.